Region: Found throughout all of North America. Life cycle: This lady beetle only produces one generation each year. In most areas, the adults overwinter in garden debris, except in the West where the adults migrate in the fall to hibernate in the mountains. 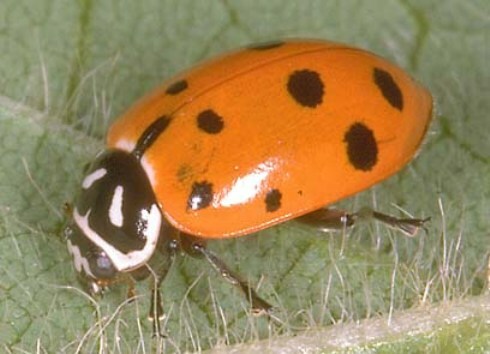 Physical Description: The wing covers of this lady beetle are red or orange and usually have 12 black spots. The pronotum is black with two white stripes and white rims. This beetle is 1/4 inch long. Its eggs are orange and are very cylindrical. The larva is black with orange spots and is long, about 1/2 inch, and flat. Feeding characteristics: This lady beetle, both adult and larvae, primarily eat aphids, but will also feed on mealybugs, scales and other small insects. This beetle is important to have around the garden. Controls: No controls are necessary. The lady beetle is an important insect predator to have in your garden.